Pronouns are words that take the place of nouns in sentences. Example: Mark will take Mark’s little brother with Mark. Mark will take his little brother with him. 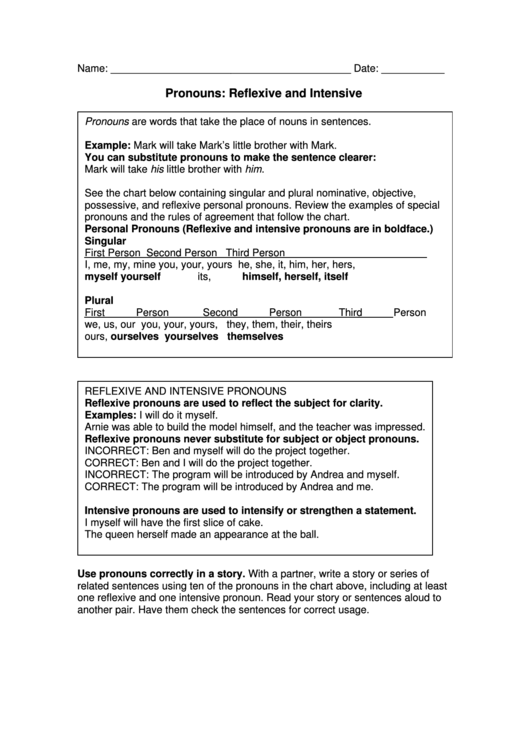 pronouns and the rules of agreement that follow the chart. Reflexive pronouns are used to reflect the subject for clarity. Examples: I will do it myself. Arnie was able to build the model himself, and the teacher was impressed. Reflexive pronouns never substitute for subject or object pronouns. INCORRECT: Ben and myself will do the project together. CORRECT: Ben and I will do the project together. INCORRECT: The program will be introduced by Andrea and myself. CORRECT: The program will be introduced by Andrea and me. Intensive pronouns are used to intensify or strengthen a statement. I myself will have the first slice of cake. The queen herself made an appearance at the ball. another pair. Have them check the sentences for correct usage.